There is a reason why Amazon has a price to earnings ratio 16X higher than Walmart. A reason why subscription commerce companies are incredibly hot, and a reason why Dollar Shave Club was worth $1 billion with company sales of just $200 million. Knowing your customer is the new superpower for brands and retailers. Engaging with them daily or weekly supercharges commerce. And the closer a brand connects with customers, the more valuable it becomes. Customer journeys are complex. They can involve three to five screens, offline and online touchpoints, and six to 10 marketing channels. They trace nonlinear paths that start and stop in seemingly random places. Mapping them is no longer easy, if it ever was, and not nearly as profitable as marketers would like. The new omnichannel isn’t just providing experiences for customers in multiple channels, nor coordinating branding and functionality across those channels. The new omnichannel is truly knowing your customer deeply across taps, clicks, and bricks, and enabling seamless contextual engagement across them all — but especially mobile, where so many of today’s digital channels now live. This is the new table stakes for a smart, connected, and demanding generation of consumers — but one that only a tiny minority of brands currently enable. As buying, shopping, and retail change, we investigate how top brands are enabling known, signed-in experiences for customers across multiple channels, and then highlight the five keys to enabling your own retail or brand success. Mobile is where growth is happening, and m-commerce is in rapid growth. This is not fake news. But context matters. Here’s the context that is helping successful brands win. Mobile web traffic surpassed desktop in late 2016. 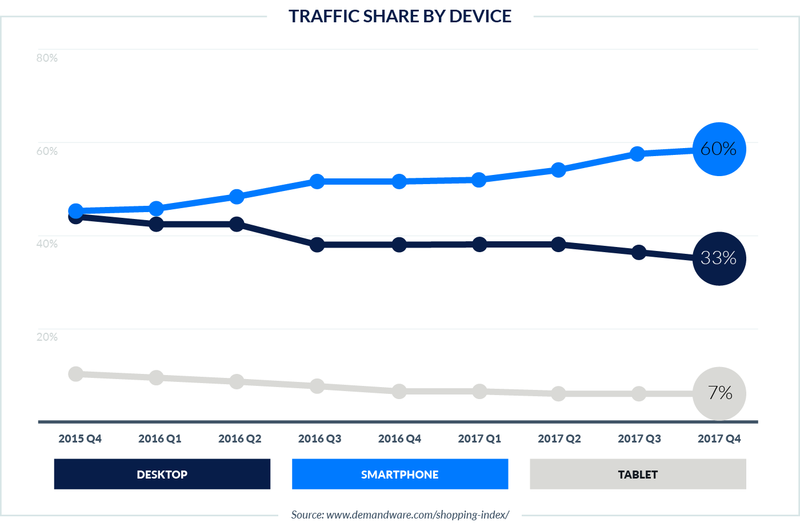 In the U.S., smartphone traffic to retail sites starting passing desktop in late 2017. Add in tablets, and mobile traffic to retail sites is as high as 56% and growing, while desktop traffic is as low as 44% and dropping. The force is still strong with desktop retail sales in many regions. But m-commerce is clearly growing, and quickly. In fact, globally it’s bigger than desktop commerce, thanks to massive countries like China and India where digital commerce is not just mobile-first, it’s mobile-only. (In fact, by itself China made up 67.1% of all m-commerce sales worldwide in 2017.) M-commerce will be a full 64% of retail digital sales in 2018 thanks to massive jumps of 40.3% in 2017 and 33% again this year. Again, context matters. And location. North America and Western Europe are different markets with different retail habits. Thanks to a history of desktop computers, more conversions in these markets happen on the big screen on the desk rather than the small screen in the hand. This means that brands and retailers face dual challenges. First, they have to recognize the growth rate of m-commerce, understand that mobile-only countries are showcasing a future state for most of the world, and prepare for it. But secondly, they have to understand the context for commerce in all of the regions they operate, and operate equally effectively in each of them. Mobile traffic is up, and it will continue to increase. 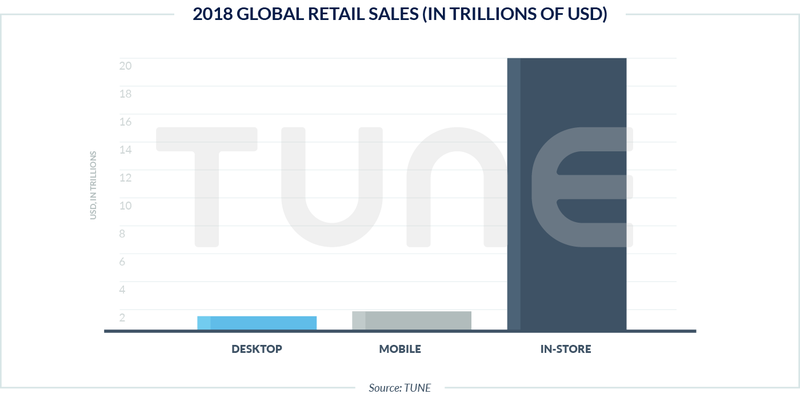 But in all the giddiness around the growth of mobile, it’s important not to lose sight of the fact that desktop still drives the lion’s share of digital purchases — at least, in the United States. In spite of the fact that desktop drove a minority of retail visits last holiday season, the big screen punched above its weight in terms of consummated purchases: 61%. Interestingly, 26-30% of all desktop conversions are preceded by a mobile click, according to data from more than 5,000 retailers. The data on m-commerce, e-commerce, and traditional storefront retail is compelling enough. People are voting with their feet — and their fingers — and we see an emerging picture of brand and retail sales and service that embraces both technology and location. That becomes even more clear when we ask 2,750 people how they like to research, shop, and interact with brands. Brands often say hello to new prospects or catch up with old customers on mobile. This is simply a function of where people spend time with digital media. 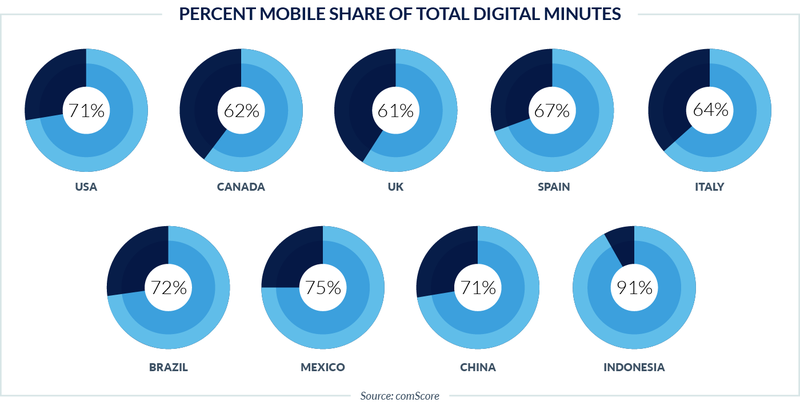 In the U.S., for example, 71% of consumers’ digital media time is spent on their smartphones and tablets. In Indonesia, the equivalent number is 91%. That’s reflected in our recent survey of 2,750 consumers in North America and Western Europe; 67% of respondents said they mostly see brand messages on their phones or tablets. It’s important to note, however, that most consumers encounter brands across a wide range of digital media. We asked respondents to select all that apply, and 46% said that desktop is still an important meeting point with brands, while an equivalent number said the same about old-fashioned TV. Interestingly, stores are still important at this initial phase for 30% of consumers. Also interesting: Younger people over-index on mobile and streaming TV (Netflix, YouTube, Hulu), as expected, but also over-index in one other place that’s not as expected: physical stores. Mobile’s not just where people meet brands, though. Clearly, when people research brands, they use multiple methods. Mobile’s the easiest, because it’s always at hand, but desktop is also popular: it’s easier to go in-depth, see more details, compare options, and open multiple browser tabs on a larger screen. Security may be perceived as better on desktop as well. Again, mobile unsurprisingly skews young. Smart speakers also skew young. Approximately 18% of respondents ages 14 to 34 like to ask Alexa, Siri, or Google Assistant for information about their potential purchases, compared to just 9.2% of respondents ages 35 or older. For every age range, about 30% of responses and 1 in 5 respondents state a preference to do product research in an actual store. The customer journey is complex and we won’t explore it all in this report. But early stages — initial encounters and subsequent research — are critical phases. While desktop is not the most critical place for meeting brands in North America and Western Europe, it is one of the most critical places for winning the research and evaluation phases. 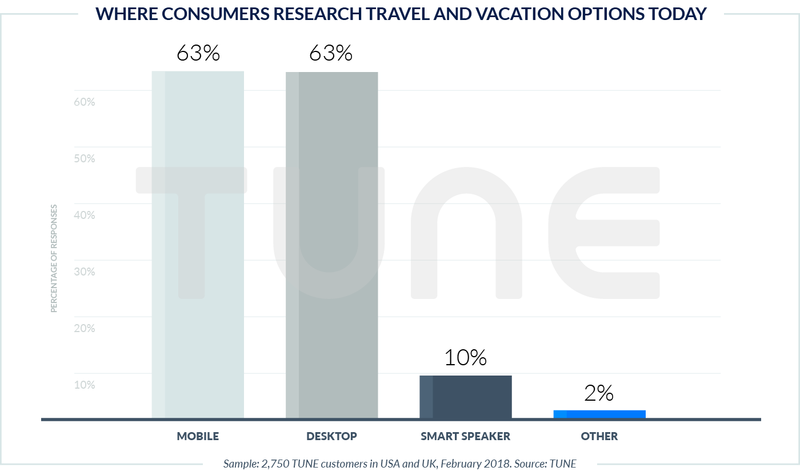 Desktop ranks second to mobile on the research phase, as we see above, but that changes when people are researching complex purchases like travel and vacation options, where it’s neck and neck with mobile: 62.8% of our 2,750 respondents said they researched travel on their phones; 62.65% said they did so on their desktop computers. What we’re seeing is that the two options are not really in competition. Mobile and desktop are in collaboration: most people take different steps of the same customer journeys on multiple devices, using each for what it’s good at. Mobile is the king of accessibility: it’s always 3 feet or less from your body. Desktop is the queen of depth: it shows comparisons, large pictures, and complex data. It’s important to note here that “travel and vacation options” in our survey is a proxy for unusual, special, and complex purchases that require investigation, research, comparison, contrast, and detailed decision-making. When we look at these kinds of decisions, consumers like to use the larger screen as well as the smaller screen. It’s also important to note that none of these channels is being used in isolation. People are combining different media to make decisions, and that’s true both within mobile and desktop as well as across mobile and desktop. Apps, video, email, web, and messaging are just a few of the key methodologies on mobile; web and email are some of the equivalent methodologies on desktop. People like to buy in real, actual, physical stores. They really, really like it. In fact, 49% of respondents picked stores as their favorite place to buy even basic, simple, and repetitive purchases. Another 28% said their mobile device is their favorite place, and — contrary to the hard data on where purchases actually happen — 17.5% prefer their desktop computers. 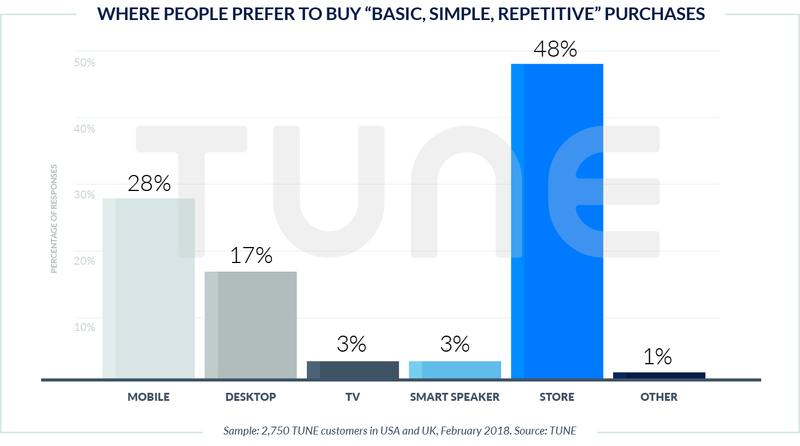 Just 3% of people said a smart speaker like Amazon’s Echo, Google Home, or Apple HomePod is their preferred way to purchase. That changes with age, but not much. 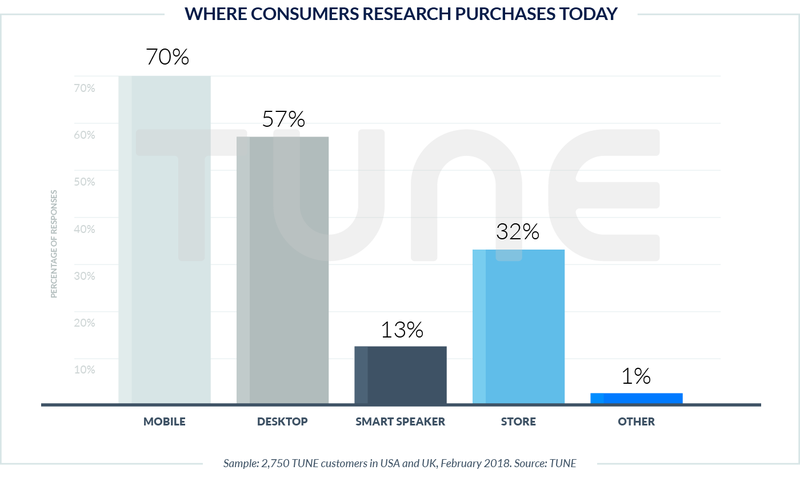 Around 44% of people ages 14 to 34 still prefer a store, while 34% prefer their phone, and just 3.8% picked a smart speaker. 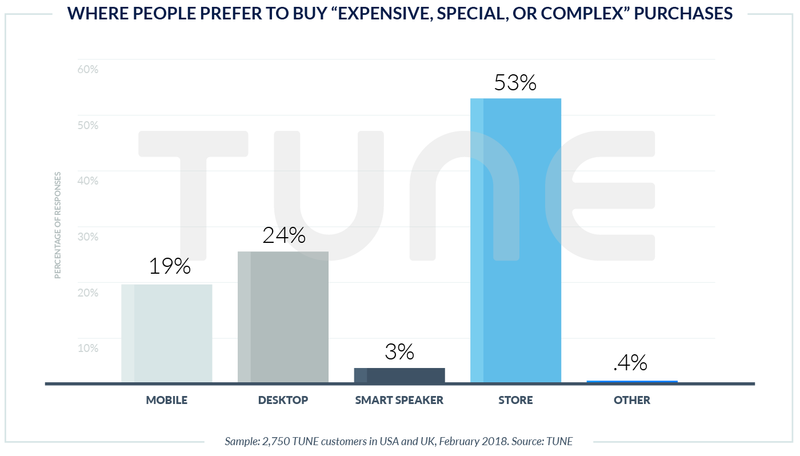 The sweet spot for voice commerce seems to be age 25-34, where people are young enough to be open to technology and old enough to afford all the toys: 13.2% of consumers in this age range pick the spoken commerce option. And, sometimes, people want help from a real, present human being to validate a purchase … or to return one when problems arise. 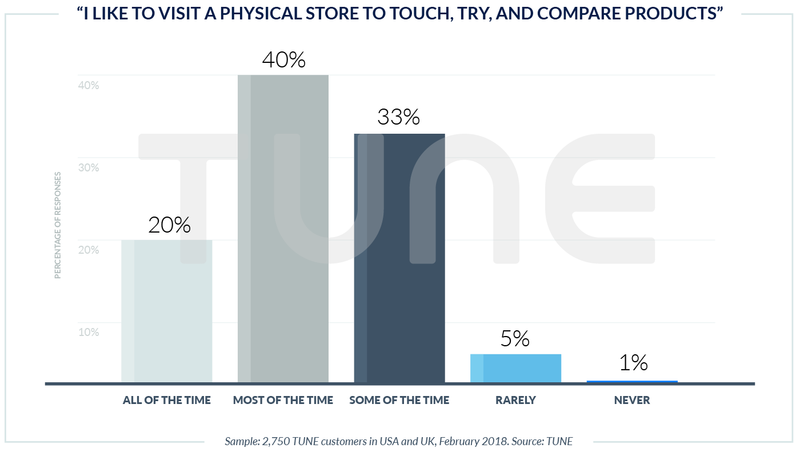 Around 3 in 5 people, or 61%, like to visit a physical store to touch and try products, or to get quick exchanges, all of the time or most of the time. Only 6.4% rarely or never want to go to a store. That’s not just old fogies: 68% of respondents ages 14 to 34 said they want to go to a store all of the time or most of the time, as well. Brands need both apps and web to compete effectively for consumers’ dollars. 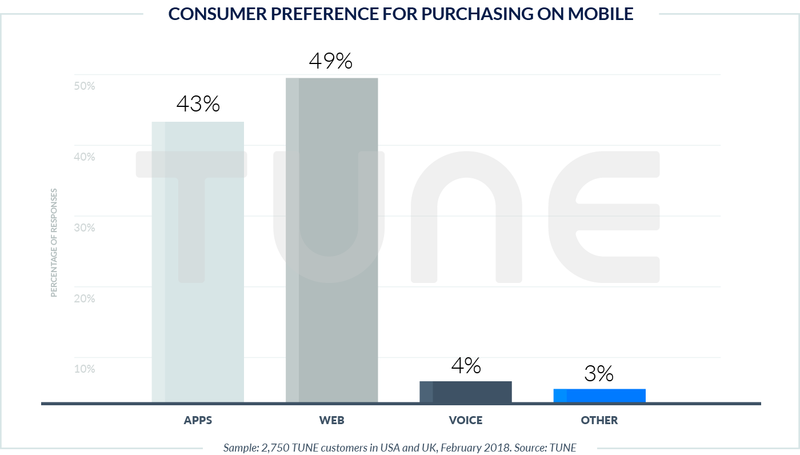 Consumers are split almost down the middle when it comes to making purchases on mobile, with a slight preference for using mobile web (49%) versus apps (43%). Interestingly, while the numbers are still close, that preference is reversed for younger people: Consumers ages 14 to 34 prefer apps to mobile web, 50% to 44%. However, apps are critical, and not just because 1 out of every 2 consumers prefer to purchase with the Amazon or Starbucks app instead of a mobile browser. Apps are critical because a brand’s most valuable customers tend to be dedicated app users (which you’ll see in the interviews that follow). In fact, the VP of digital marketing for GameStop once told me that his app-using customers were more valuable than the top-tier members of the company’s loyalty card program. While this report focuses mainly on initiating the customer journey, the entire journey matters, and increasingly so with smart configurable products. A long-term customer is clearly more valuable than a one-off purchase. Luckily, a majority of customers are just fine with brands staying in touch. That’s especially true when a special or smart product is involved. Of course, smart products totally change the customer journey paradigm. Traditionally, retailers and customers interacted primarily at the point of purchase. With a smart product — think Nest thermostats, Wemo smart switches, Amazon Echoes — that journey changes dramatically, as an episodic event centered around a purchase becomes an ongoing relationship centered around a series of activities. Not only are consumers more interested in staying in touch with brands after buying smart products, 69% of consumers have a significant interest in buying smart products. That’s a real opportunity for brands to have an ongoing relationship with their customers. Important note: It’s also an major opportunity to demonstrate trustworthiness with private and identifiable data. Mobile traffic is up. M-commerce is growing fast. Desktop conversions to sales are still strong. And yet, the lion’s share of all commerce happens on the street. That means change is happening, sure. But more critically, convergence is happening. And that’s a much bigger story about retail than any individual data point on mobile, desktop, or store. Personally, this became obvious a couple months ago, in February 2018. Coming off the ice after a hockey game, I discovered that my skate blade was cracked — broken in two, even. That was the first time that anyone on my team, including me, had seen that kind of equipment failure. And it meant I immediately needed a new pair of skates. After hearing the news, my wife checked her email on her smartphone, sure she had just seen a promotion from a sports store that we frequent. Jackpot! She found a 15% off coupon for online orders at Sport Chek, a local sporting goods store. Needing more screen real estate to evaluate skate options, I jumped on her iMac and found a high-quality pair from Bauer, a brand I’ve bought in the past. Last year’s model was an additional 40% off, which tipped the scales. My credit card got some exercise. Three days later, I had the skates at home. I put them on: instant pain. Either I’m a hobbit, or my feet had expanded. I needed the extra-wide size. I called Sport Chek and explained the issue. The call center employee found the exact same skates in a nearby store and reserved a pair for me. In summation, we touched the brand five different ways, in four different “media,” including delivery and in-store, and twice on mobile. Alternatively, the brand touched us, making itself available — and top of mind — via both promotions (which are important) and availability (which is critical). That’s omnichannel in action. A convergence of capability: seamless digital and in-store experiences. E-commerce giants see the numbers and the trends. They know that if they want to access untouched trillions in retail revenue, they need a home on Main Street in addition to an icon on a smartphone or a bookmark in your browser. Amazon is a key example of this migration to Main Street, and not only due to the acquisition of Whole Foods. An Amazon Books location, featuring curated book selections and Amazon gadgets such as the Echo and Kindle, in New York, NY. Photo credit: Jeremiah Owyang. Used with permission. Apple and Microsoft started the tech company trend of opening physical stores, but now many e-commerce retailers are joining this reverse migration from the web (and mobile) to the street. These retailers are opening pick-up kiosks, try-before-you-buy storefronts for multiple brands — think b8ta — and full-on retail stores with design, product selection, and functionality informed by digital commerce. Think Warby Parker, which was born online in 2010, and this year will have almost 100 physical stores. Or Bonobos, with 48 locations now. Everlane (apparel), Casper (mattresses), and Untuckit (men’s shirts) are all following the be-everywhere playbook too, while more traditional brands like Sephora, Best Buy, Home Depot, and Walmart have made massive strides in extending physical locations with fully mobile- and web-optimized omnichannel strategies. Given what we’ve seen from consumers — and will shortly share in this report — both online to offline and offline to online migrations are smart moves. As I jumped on the ice for my next game in my new skates, it struck me: This was omnichannel in action. From mobile, where my wife was connected to the retailer, to desktop, where it was easier to consummate a purchase, to call center, to actual physical store, Sport Chek was visible, active, engaged, and operating off the same dataset (as far as I could tell). It’s been popular to assume that physical stores are white elephants: increasingly obsolete remnants of an earlier age. And it’s true, for certain segments of the population, that the combination of e-commerce and cheap, speedy delivery has been irresistible. But the data suggests that’s not a massive slice of the population. And there’s evidence from hip young retailers like Warby Parker and b8ta that even these tough-to-reach customer segments are open to retail in a multitude of media. Omnichannel is about integrating the various ways consumers interact with and purchase from retailers and brands. Without knowledge, brands can’t tailor customer experiences. Without data, retailers can’t make smart choices about consumer needs and desires. Without a logged-in experience, whether on the web, in an app, or — as is increasingly available — a known, personalized in-store experience, brands cannot effectively provide service or support. Knowing your customer is the new superpower. Engaging with your customer is the source of that power. And earning the logged-in experience is how you get it. When your product or service is structured to provide substantive customer value for signing up and logging in, and when your brand promise is strong and trustworthy enough to warrant customers making the effort to do so, you’re in a position to know your customers. Known customers have engaged with a brand, and engaged customers buy 90% more often. In fact, customers who sign in to their personal accounts on e-commerce sites “convert 10X more than average,” says Duncan Keene, the UK managing director for ContentSquare. And repeat customers spend twice as much as new customers. Therefore, brands that know their customers well enough to build strong relationships with them are more likely to be able to generate stable ongoing sales. They are then worth much more than brands with unknown customers who have to fight for existing as well as new market share every single month. Ergo: Knowing your customer is the new omnichannel. From house brands in the 1990s to Amazon Basics today, retailers have long been recognized as brands. And while some brands have tried multiple paths to market, we’re seeing an increasing trend for brands to sell direct to consumers in ways that would be been unthinkable in previous decades. Under Armour sells direct to consumers on its website. Nestle brands go direct to consumer via subscription commerce. Apple has long sold straight to users, and Microsoft does as well. Google has followed suit over the past few years. When Gillette was threatened by direct-to-consumer competitors, the company launched the Gillette Shave Club. Olay is resistant, but has been testing the model with some products, and many other brands have followed suit. Brands that know their customers’ names, shipping addresses, and credit card numbers are in much greater control of their financial destiny than brands that rely on shelf space and digital placement. In addition, they have a much greater opportunity to retain business and upsell to a greater wallet share with complementary products. What’s the difference? Knowing your customer. But as we’ve seen, relationship trumps all. Citi is a $2 trillion organization with 3,500 employees, and its customers range from seniors who bank in its 4,600 branches to millenials who bank exclusively via app. All channels are important, Citi’s Chief Experience Officer Alice Milligan says, but not equally so. Citi’s invested in its mobile app, offering features like automated push messaging for credit score changes, and the option to save progress midway through a transaction and return to it later. Other app features include spend analysis, reward redemption, and tracking replacement cards. The company also offers mobile web functionality and experiences via other channels, and works hard to be omnichannel. Particularly in banking, though, there’s something undeniable about apps. That sophistication has helped Citi grow young customers: “About 40% of our mobile app users in the U.S. are millennials,” according to Milligan. More importantly, this strategy has enabled Citi to know its customers personally and engage with them regularly — strong hedges against competition, and a major foundation of profitability. Interestingly, about 15% of Home Depot’s mobile app usage occurs within the company’s physical locations. Of course, that’s the key: signed-in customers. Only when customers sign in can Home Depot provide the experience and resources that customers want. And only when customers sign in can Home Depot get the customer data it needs. And yes, mobile web matters. That said, mobile app is for high-value customers. Shopping for major home appliances is a big deal, and consumers want to see and compare multiple models when making a decision. That takes screen real estate, which desktop web delivers. From there, Home Depot makes it easy to take the purchase process in-store by also showing what models are in stock at the local outlet, and by texting the product location to customers’ phones. For Home Depot, the “end-to-end” customer journey is critical: discovery and purchase, sure, but also delivery, ownership, use, and service. That includes returns and exchanges, which generally happen in-store after an online purchase. Walmart: Store Assistant to Shopping Lists to … Home Delivery? Walmart is a retail giant with 2.3 million employees and a strong desire to take on upstart online competitor Amazon. Recent acquisitions have bolstered both the company’s overall technical capabilities and its mobile chops, and the results have recently become apparent. Similar to Home Depot, Walmart’s app now automatically shifts to Store Assistant mode when opened within a Walmart location, which can be 200,000 square feet or more in size. Add it all up, and you get two major wins for Walmart’s mobile strategy. Second, if customers use Walmart’s app to shop (building in-app shopping lists) and pay (Walmart Pay), they’re just one short step away from ordering online and having their shopping list delivered. In both scenarios, Walmart is incentivizing known customers in two ways: convenience, and lower prices. As app use grows, it’s easy to imagine Walmart stores as the see it/try it distribution centers Amazon is now acquiring, and it’s plausible that a significant percentage of its business could transition to a delivery model — or run on a subscription basis. That makes a lot of sense for its grocery business especially, which accounts for 56% of Walmart’s sales. Grocery customers who purchase digitally are more profitable customers for the retail giant … and the key thing about groceries is that you need them every week. Walmart may have stumbled in its most recent quarter, leaving Wall Street unhappy with “only” 23% quarter-over-quarter digital commerce growth, but the company’s long-term strategy is still sound. And that long-term strategy is predicated on known customers. While you may not know the name OceanX, you’ve more than likely ordered a product or subscription from one of their clients. OceanX runs weekly and monthly product subscriptions for 30 top global brands, including retailers and CPG companies. All told, the company’s 60 engineers and 40 data scientists generate over a billion dollars in annual revenue through product subscription services — think along the lines of Dollar Shave Club, Proactiv, and Birchbox — for their clients. Product subscriptions are a unique and recent niche in commerce that bridge the world of physical products with the economics of software-as-a-service business models. Add in a direct, one-to-one relationship with a brand’s end customer, and the result is both lucrative and predictable — enough so that a young upstart named Dollar Shave Club sold for $1 billion to a major brand. When spinning up a new brand, retailers usually advertise on Snapchat, Pinterest, and Facebook before finding the one or two channels that work best. They spend about 30% of revenue in acquiring new business, signing up customers on a website, and putting them on a regular email distribution. Buyers customize their products on the site, and receive boxes of new product on a regular basis, usually monthly. It’s all about the relationship between the brand and the customer, and the oil that greases that wheel is data. That data helps brands be more human, Richter believes. Desktop commerce still accounts for more business than mobile commerce in the U.S., but that’s not the case globally. And the U.S. is at the tipping point where m-commerce will soon surpass e-commerce, according to Bradley. “Research online, purchase anywhere,” says Bradley. In essence, this is an omnichannel strategy, as Unilever’s focus is to deliver a great customer experience anywhere — no matter the device, and no matter the screen size. The next step, however, is one-to-one relationships with customers. Brands need consistent presentation and capability across channels. At home, at work, and out with friends, you might show different aspects of your personality, but you’re still the same person. The same is true for brands. And it’s not just about digital commerce. It’s about all commerce, in all channels. Mobile is still critical in an omnichannel environment due to its ubiquity and (as we saw earlier) the preponderance of time people spend on their mobile devices. This means it’s key for brands to offer a mobile-optimized experience, says Ranta. But mobile isn’t just about the last mile of payments. Nearly 400 million people use eBay, spending close to $90 billion a year via the web’s original auction site. That’s huge volume, and it’s accompanied by huge diversity in channels — even though most of them are mobile. “We are focused on making a more personalized, seamless online shopping experience across multiple screens, giving our customers the freedom to shop online anywhere, when they want and how they want,” says Meeks. This makes good sense, given that 61% of eBay’s $90 billion gross merchandise value involves at least one mobile touchpoint. It also makes sense because web is still important. For eBay, commerce happens quicker on desktop web than on mobile app. The end result is mobile-first, but via multiple mobile-mediated channels, and (of course) known, signed-in experiences in each of them. You’re aware that retail is changing, and that the customer journey is getting more varied and complex. So the question becomes: How do you align your resources to position yourself for success? Here are five critical components. Dollar Shave Club sold for $1 billion not because it had huge sales, although it was growing fast. The company sold for a billion dollars because it had a direct relationship with their consumers — a business model that Unilever, its new corporate parent, needed to learn. Three million existing customer relationships didn’t hurt, either. The price tag reflects that Wall Street has come to value this direct consumer relationship. So does a recent 17% tumble in Walmart’s stock price following its Q4 2017 financials, released in late February of 2018. Ostensibly, the problem was that Walmart’s digital sales grew just 23% in the final quarter of 2017, down from 50% in Q3. Even considering the slice of Walmart sales that take place online — and aside from 23% quarter-over-quarter sales growth being nothing to sneeze at — the market sees Amazon growing faster, and better positioned to dominate digital sales. Amazon, Tzuo suggests, is winning because it knows its customers. Amazon knows what they’ve bought, what they’re searching for, and — using data from millions of purchasers and AI-driven models — what they will want in the future. It’s not about e-commerce versus retail. “It’s always been about flipping the script — starting with the customer as opposed to the product sale, and wrapping both your e-commerce and your retail channels around that customer experience,” says Tzuo. Knowing your customer is a fundamentally different experience for both brands and retailers. Knowing your customer also transforms a previously episodic relationship mediated largely by advertising and accident into something that resembles the software-as-a-service model: stable, relationship-driven, repeatable revenue. This SaaS-like retail relationship can only happen in signed-in environments, whether a customer is on mobile app, mobile web, or desktop web. “The simplest way to deliver a seamless experience to consumers is with an authenticated account. When logged in, you see the same information regardless of your device. Logins of this type also provide e-commerce companies with a wealth of data and a direct channel to reach their customer with highly personalized offers. Consumers have been socialized to expect to need an account to sign on to Netflix or hail a Lyft. But they don’t have the same relationship with traditional retail or CPG brands, who then suffer from poor customer experiences (shopping carts with different items) and generic promotions. Subscription commerce is one way to create that signed-in experience. An engaging mobile app with customer history is another, as is an account with a desktop e-commerce site. Best of all? Having all three. The key is what this experience provides: data. Data may not exactly be the new oil, but it’s certainly and irreplaceably valuable. Avoid being “most brands” by incentivizing logged-in experiences. It’s no longer a matter of just being accessible by one or two media anymore. That’s not how your customers live. In a customer-centric world, you need a customer-centric mode of marketing and operating. Any channel on which a customer chooses to approach you is a good channel. But this doesn’t mean you should stretch the bounds of rationality with limited budgets. It does mean that web (mobile and desktop) and app are the minimum standards. And it also means that marketing and support channels like email, push messaging, and call centers should be operating off the same data and awareness of customer activity as the commerce components. The result? A customer journey, connected. And customer centricity. Whatever is the easiest, fastest, most accessible way to make a purchase in that moment drives the choice, says Key. Sometimes — perhaps even most of the time — you don’t have control over the environment in which a potential customer meets you. At that point, limit your expectations while still striving for the ultimate end goal: a personal relationship with a new customer. As taps, clicks, and bricks commerce evolves omnichannel from simply being available everywhere to deeply connecting with customers everywhere, apps take on new roles. We’ve seen how Home Depot and Walmart are using apps to augment the shopping experience, both before the customer enters a store and while inside a physical location. Today’s shoppers want more product information than can fit on a shelf, and apps can provide it. But the advantages of apps for brands and retailers extend beyond these use cases. Push messages about sales or specials that a customer cares about can boost in-store visit frequency. Shopping lists for common items can transition to pick lists for in-store pickup strategies, or shopping carts for m-commerce consummation. The best customers, as Citi notes, are app-using customers. GameStop VP of Multichannel Jason Allen has noted to me to that GameStop’s app-using customers are its most valuable customers — more valuable than even the top-level members of its loyalty club. And numerous retailers and brands say that while omnichannel is important, mobile app is the most important channel. 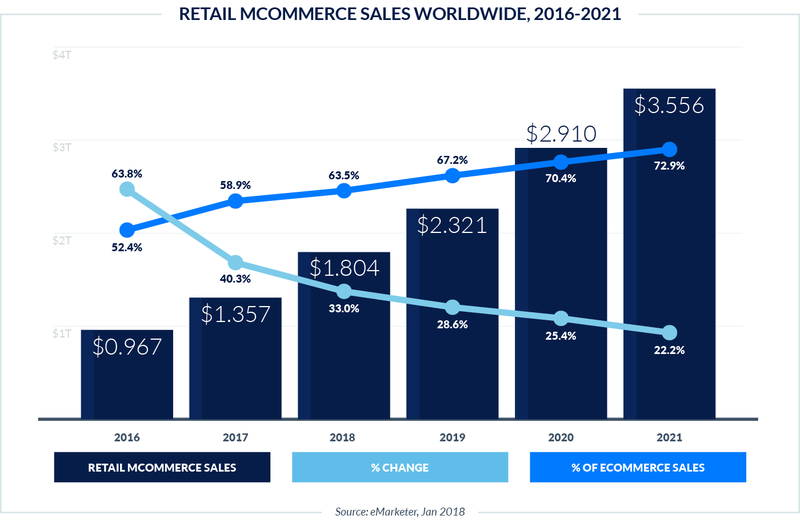 This makes sense because even though 88% of global commerce is in-store, digital commerce (specifically m-commerce) is growing quickly. M-commerce expanded 40% in 2017 and is expected to grow another 33% in 2018 — and most of this growth is in-app. The physical shopping experience is still king, but it’s clear that augmenting it with technology is improving retailers’ results. Adding physical-like features to m-commerce could give brands that don’t have an in-store experience a leg up. Stores still claim $9 out of every $10 spent globally. And consumers overwhelmingly indicate a preference for a physical shopping experience. Augmenting these physical encounters with apps, however, is changing the in-store experience and making it richer. Integrating it into digital supply chains is connecting store experiences with web and mobile app experiences. In addition, stores are changing. Traditionally, stores have been known as the place where all the products live and all the products can be purchased. What we’re seeing now from leading retail innovators like Amazon and b8ta is that the top-rated and most popular products get store shelf space for touching, feeling, and comparison testing. And what we’ll see in some stores of the future is that customers may not walk out with all their purchases in hand, as the showroom becomes just that: a show room. The most innovative new retailers (like Apple and Everlane and Warby Parker) make much more per square foot than traditional retailers, which bodes well for their future. This doesn’t mean every brand needs to be everywhere. That’s omnichannel customer engagement, and that’s the new superpower merging taps, clicks, and bricks: mobile, desktop, and the real, physical world. TUNE conducted interviews in-person and electronically with 70 top marketers from leading brands and agencies. 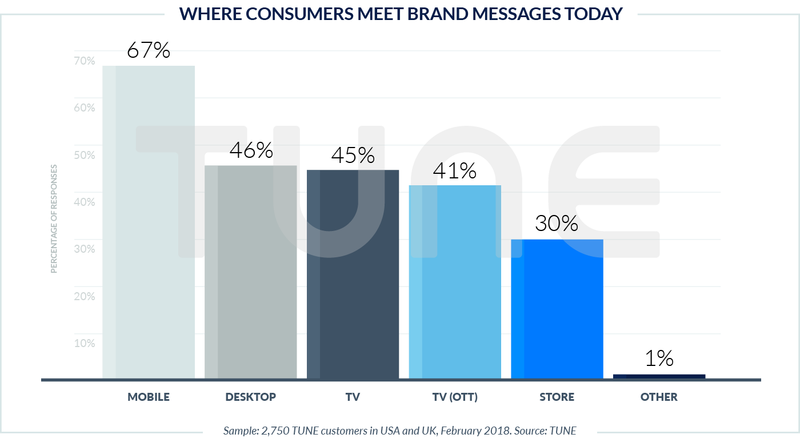 TUNE also conducted a survey of 2,750 consumers age 14 to 65+ in mid-February 2018, including 1,761 Americans and 989 U.K. citizens. 1,541 are female and 1,209 are male.